The relationship between the United States and Canada is among the closet and most extensive in the world. About 300,000 people every day cross between the two countries, along with billions of dollars in trade. In New York alone, $33.8 billion in goods are traded with Canada every year. Our close relationship means that we collaborate on issues ranging from commerce to border security. Many of Buffalo’s most prestigious law firms have offices in Canada, and an increasing number of law firms and businesses are looking for attorneys knowledgeable in U.S. and Canadian law. At the University at Buffalo School of Law, we make it easy for you to acquire the skills to be adaptable and flexible to meet the needs of the United States’ largest trading partner. And we’re close to home, so you can study law during the day and make it home for dinner that night! 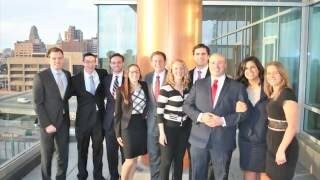 Located within 98 miles/158 km of Toronto, the University at Buffalo School of Law offers you an exceptional legal education in a collegial and supportive environment. Located 25 minutes from the international border crossing at the Rainbow Bridge and 20 minutes from the Peace Bridge, our law school is a small, close-knit community within an international research university ranked 25th in the United States for the size of our international student enrollment. Completion of the J.D. program makes you eligible to sit for the New York State Bar Exam. After passing the exam, you will be authorized to practice law in New York, and to sit for another state's bar exam if you wish. You cannot, however, use your J.D. from the School of Law to practice Canadian law in Canada right away. The Canadian system has its own requirements, although you may practice New York law while in Canada if granted a permit as a foreign legal consultant. For internships, externships or other employment, Canadian students need to be properly authorized to work in the United States by U.S. Citizenship & Immigration Services (USCIS). While you’re in law school and directly after graduation, work authorization can take the form of Curricular Practical Training (CPT) or Optional Practical Training (OPT). The Law School works closely with the University’s International Student and Scholar Services office to help students navigate this process. To work as an attorney after graduation, in addition to taking the New York State Bar Exam and being admitted to practice as an attorney, Canadian graduates must obtain a work authorization in the TN classification. TN candidates need a job offer from an employer to apply. If you want to return to Canada and practice law there, you must apply to the National Committee on Accreditation (NCA) after graduation. The NCA assesses each application and advises applicants as to what they must do to obtain a Certificate of Qualification. Exact requirements depend on the candidate’s education and professional qualifications, and include a certain number of credits that candidates must complete. Specifically, the NCA wants you to be competent in at least the following subjects: contracts, torts, property, foundations of Canadian law, Canadian criminal law and procedure, evidence, principles of Canadian administrative law, Canadian constitutional law (with aboriginal component), corporate law and professional responsibility. Once a U.S.-trained Canadian student completes the exams and/or courses, he or she will receive a Certificate of Qualification from the NCA. Before you can practice, you must complete the bar admission requirements of the province in which you plan to work. This includes writing the barrister and solicitor exams, attending a skills and professional responsibility program, and articling (a supervised apprenticeship period after graduation in which students work in a law firm with the main focus on education and training) for 10 months. Foreign legal consultants are lawyers who earned their license to practice law in the United States and have applied and received permission from the Law Society of the particular province or territory to practice U.S. law while living in Canada. Ontario is regulated by the Law Society of Upper Canada. Ontario lawyers can employ, partner, associate or affiliate with foreign legal consultants in Ontario, but only if they do so in compliance with Law Society bylaws, rules and policies. You must apply to become a foreign legal consultant.